Boris Elementary’s Folklorico Group is composed of students who enjoy learning some of the traditions of the Mexican culture. These traditions will be expressed through music, song, and dance. Our goal is to teach cultural appreciation and provide an arena for artistic expression. Folklorico includes traditional Mexican dances that have originated in various states of Mexico. All 3rd through 6th grade students should join the group. 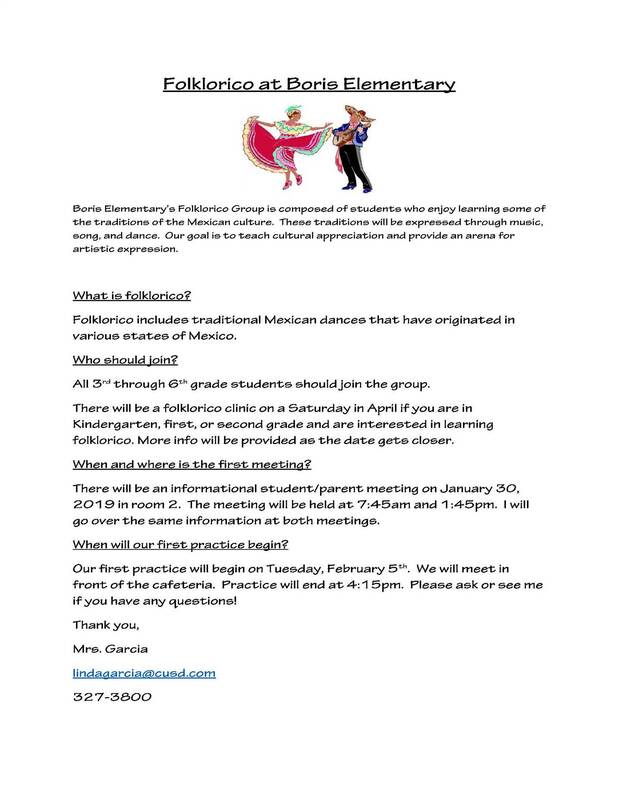 There will be a folklorico clinic on a Saturday in April if you are in Kindergarten, first, or second grade and are interested in learning folklorico. More info will be provided as the date gets closer. When and where is the first meeting? There will be an informational student/parent meeting on January 30, 2019 in room 2. The meeting will be held at 7:45am and 1:45pm. I will go over the same information at both meetings. When will our first practice begin? Our first practice will begin on Tuesday, February 5th. We will meet in front of the cafeteria. Practice will end at 4:15pm. Please ask or see me if you have any questions! Punjabi Dance (Bhangra) refers to several forms of folk dance and music that originate in the Punjab region of India. The dance is generally performed during the Vaisakhi festival. 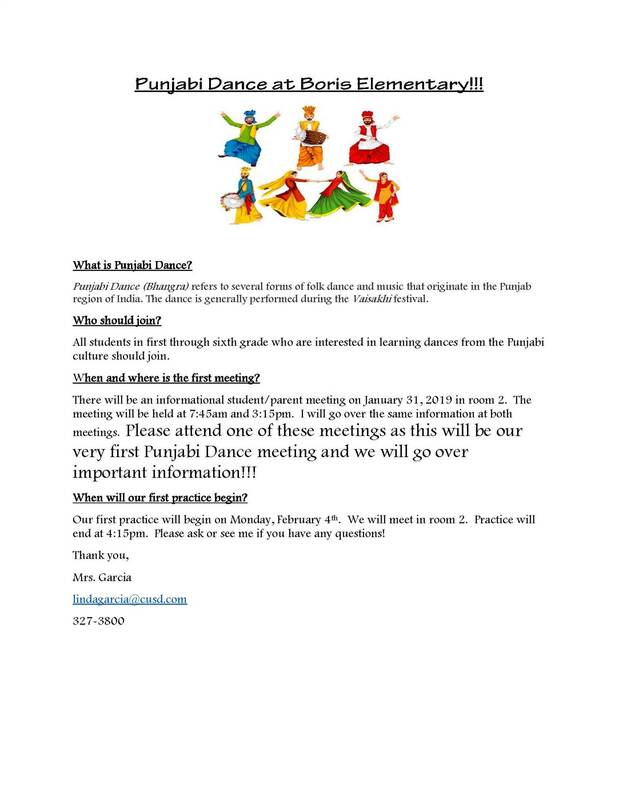 All students in first through sixth grade who are interested in learning dances from the Punjabi culture should join. There will be an informational student/parent meeting on January 31, 2019 in room 2. The meeting will be held at 7:45am and 3:15pm. I will go over the same information at both meetings. Please attend one of these meetings as this will be our very first Punjabi Dance meeting and we will go over important information!!! Our first practice will begin on Monday, February 4th. We will meet in room 2. Practice will end at 4:15pm. Please ask or see me if you have any questions!